How to find your personal favorite harmonica? First off, if saving money is your main objective, then go with the Special 20. The Manji and the Crossover are in another league, and they’re also a bit more expensive. With that said, I think it’s very important to find your favorite make and model of harmonica, so that you can get acclimated to the feel and responsiveness of that particular instrument. Different types of harmonicas have different technologies and craftsmanship, so their performance can be radically different. Which one is best is a matter of personal preference (in the same way that one person may prefer the performance of a Corvette over a Lamborghini). To find your own personal favorite harmonica, you really need to compare apples to apples … meaning you need to keep the key the same when sampling different makes and models. For example, comparing a Manji in the key of A with a Special 20 in C would be an unfair test. Most beginners find it much easier to bend a C harmonica than an A harmonica, so they may automatically conclude that they prefer Special 20s to Manjis ( … but their judgment would be baised). Students fall into this trap all the time, and the result is a major setback. Bending is challenging enough as it is, and if a beginner is trying to learn to bend on an unresponsive harmonica, they make get stuck and quite frustrated. 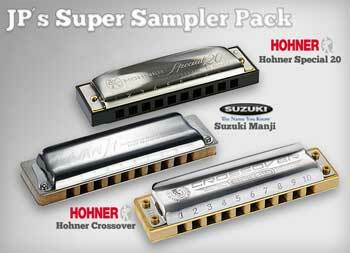 Because the Hohner Special 20, the Hohner Crossover, and the Suzuki Manji are all incredibly responsive instruments, I want to give you the opportunity to compare them at a respectable discount. I know you’ll be totally blown away to finally put a high-performance instrument in your mouth and let those bends come wailing through! I’m super curious which one you’ll pick as your top favorite harmonica. Please let me know! Awesome response, superior bendability and the sweetest tone ever. The Special 20 harp is the first choice for those learning to play. Its special airtight design makes it the most recommended go-to harp for harmonica players of any style, including blues, country, folk or rock. The plastic comb doesn’t absorb moisture making it longer lasting. Harp of choice of harmonica virtuoso John Popper (of Blues Traveler) and played by Bob Dylan on his 2007/08 tour. Chances are your favorite player has several of these harps in his case. 12 major keys plus lower and higher octave tunings. Classic Line: Traditional values. Modern innovation. Durable plastic comb with recessed reed plates for playing comfort. The stable, airtight construction and full sound make the Special 20 one of the most popular diatonic models. Kp>I’m pretty sure you’ll be delighted with how easy this instrument makes it to bend notes (including over-blowing) while maintaining a rich and silky tone. From the Manufacturer: With the Crossover we have expanded the Marine Band series to introduce a new, top-of-the-line professional quality instrument for the discerning player in modern blues, rock, jazz, soul or funk. The revolutionary laminated bamboo comb (patent pending) is completely sealed, making it water repellent and exceptionally stable. In combination with the screw together assembly the Crossover is extremely airtight, with fast, even response and a raspy, powerful sound which is exceptionally well suited to amplified playing as well as acoustic styles. The modern compromise tuning is ideal for single note playing in different positions in contemporary blues, rock, jazz, soul, funk, while still ensuring a full chord sound, making the Crossover an optimal addition to the great Marine Band range. I enjoy the suzuki pipe hummers which are round, I think they have a nice sound and are louder. Haven’t tried bending with them yet.